It was inspirational to hear author/illustrator Bob Graham speak recently at the CBCA book conference in Sydney about his lifetime of illustrative work and book production. A humble, talented and lovely man, it was a thrill to see him honoured with a musical tribute at the end of his talk, and to be treated to glimpses of his in-process illustrations. An Aussie children's book icon, there's no mistaking the gorgeousness and familiarity of Graham's illustrations, with their quirky and adorable style that underpins such emotion. Like the talented Stephen Michael King, his work is also steeped in simplicity, and it is often the simplest of storylines that speak to children the most. 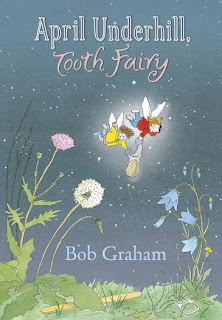 In April Underhill, Tooth Fairy, we meet the Underhill family - mum, dad and daughters April and Esme, who live, like teensy humans in a little house under a tree stump in a great field by a trundling freeway. Dad John, a be-pony-tailed cool dude, is hanging the washing to dry, hippy-chic mum Fay is in the bath and all else is pretty much normal except for the scattering of teeth hanging from the rafters and the giant strawberry on the sideboard. When an order for a tooth-collection comes in, young April and little sister Esme insist on taking the job. But Mum thinks they're far too young. And there's a motorway next door now... things have changed and are far more dangerous (sound familiar, parents?) now. After much pestering, the girls are allowed to go on the tooth-seeking job, with a promise to send Mum a text if they need help. April and Esme's tooth-gathering adventure turns out to be fun but uneventful. During the tooth-retrieval, the little boy begins to wake but the fairies sweet-talk him back asleep before flying past grandma's room, asleep in her bed with her book light still on. April thinks she's so adorable, she plants a little kiss on her nose. The fairies return home and get to bed by sunrise. Meanwhile, the young boy of the missing tooth wakes and runs into grandma's room to show her his shiny coin and to tell her of the amazing dream he had. It may not be an intrepid, fate-shifting storyline but what is attractive about April Underhill is the inherent simplicity and emotion... a theme that carries through all of Graham's books. The book doesn't try to be anything more than an emotive slice of life - a peek into another world kids so readily absorb and thrive on. No one has to solve anything life-threatening or overcome a plot of thickly-slathered woe. The story just Is. This kind of plot simplicity and delight can be found in some of the world's most successful and enchanting children's authors - think Enid Blyton - and Graham does it so well, reading April Underhill will just make you smile. Exquisitely charming, emotive and detailed pictures are a joy to wander the eye over and the subtle narrative will have both kids and adults nodding their heads in understanding. On top of this, the book's characters are so likeable, you could pluck them from the page and squeeze them. A little fairy dog with wings, the blatantly obvious love of the fairy parents, the courage of April... and Esme and her little round glasses... will make your heart toasty. Ultimately, this book is about home, relationships and love. If these topics - and gorgeous illustrations - float your boat, then you can't miss April Underhill.